Recently on What’s Your Point and in my blog, I have cited estimates of how much the City cut pensions in the 2016 pension changes. Specifically, I said in my blog last week that the pensions were cut by about $140,000 for fire fighters, $90,000 for police officers and $45,000 for other municipal employees. Recently some City officials have disputed my numbers, suggesting that I am spreading “inaccurate information.” So, I am going lay out for you where I got the numbers and you can decide for yourself who is spreading inaccurate information. Most of you know that the City’s pension changes were made pursuant to Senate Bill 2190 in the last legislative session. Under the rules of the House and Senate, any pension bill must be analyzed by the Legislative Budget Board to determine its actuarial impact. The LBB issued its final report on May 4, 2015. The complete report can be found but I will warn you that attempting to read it may cause permanent brain damage. The relevant part of the report for our purposes is a table that is found on the next to last page. So, the gross amounts of the benefit reductions/contribution increases were $1.2 billion for fire, just over $1 billion for police, and $724 million for the municipal employees. In each instance, these are borne by the active and retired members of each plan. Trying to determine what any particular individual member lost is very difficult because the modifications affect different groups of members differently in each plan. But, generally speaking the younger individuals in each plan, say those with less than ten years of service, were the hardest hit by the plan changes. After fire fighters, the group most adversely affected were police officers hired after 2004. That is when the City significantly reduced the police retirement plan, so police officers hired after that date much less generous benefits. But those same younger officers were saddled in the SB2190 revisions with higher contributions which, by virtue of their age they will pay for many more years than the older officers with the higher pensions. As result, the younger officers are paying for higher pensions, they will never receive. I guess that is not too surprising since they as a group, had the least to say about how the modifications would made. Remember that the figures in this graph are in thousands. So, the fire fighters got a per capita reduction of $157,000, police $108,000 and the municipal employees $28,000 on average. These reductions are actually a little worse for fire and police and a little better for the municipal employees than I calculated for my blog last week because I had previously used a draft of the LLB report. The final report had slightly different numbers. If anyone at the City can show me where these calculations are in error, I will gladly retract my statement about the amount of reductions the members of each plan suffered. But I am not going to hold my breath. [i] Again, these projections should not be taken as gospel. The projected assets and liabilities of the plans rest on numerous assumptions over several decades and almost certainly will be wrong. The estimated future costs are almost always underestimated. But these are the numbers on which the City based its plan. [ii] The calculation NPL can also be altered by changing the assumptions. But altering the assumptions only changes our estimate of the future liability not what that liability will actually and ultimately be. Mr. King, could you supplement this op-ed with another that adds in the pension cuts of 2004 and after, not just the singular focus of 2017? As the municipal and police pensions were being cut, HFD’s pension enhanced benefits by lengthening how long they could be in DROP at that time, HFD’s membership also benefiting from a large raise due to their collective bargaining efforts. Doing so would help provide a more complete picture of the comparisons you’ve made, also remembering that almost every classified firefighter still has the DROP benefit while most other city employees do not. You stated in the past that the DROP benefit amounted to well over a half million dollars, in some cases far more, so isn’t that germane to this discussion? Steve, I think you make a fair point. I have not studied the changes that were made in 2004 in detail, but I do know that significant changes were made to police that were hired after 2004. As I recall, the major changes were that DROP went away and the minimum service for went from 20 years to 25 years. However, it is also my understanding that no changes were made to any earned benefits. 2017 marked the first time, to my knowledge, that there has ever been a cut to earned benefits. Mr. King, thank you for the thoughtful reply. I do not profess to be an expert in each of the city’s pensions but during last year’s cuts, fact sheets were handed out to various representatives to provide them some context as to previous cuts to the municipal and the police pensions, all while HFD was enjoying a huge pay raise and their pensions were enhanced. Those are matters of record and easily searched independently of anything I say. It should be noted that not only was the DROP benefit cut from the other two pensions, but workers also had to pay more from every check and received markedly smaller benefits that were not to start before the age of 55 regardless of how old an employee was in HPD and over 62 for municipal workers. There were marked changes to earned benefits as well, the formulas changed so that overtime wouldn’t be included as it has been for HFD up until last year, and other pension enhancers were cut. And despite the projections by HFD’s union regarding pension funding, they have been as unwilling to provide their numbers as the city has so please take anything thrown out there with a few grains of salt, you may recall that HFD’s pension board actuaries were the ones settling for ten million dollars for providing the fake data in the early 2000’s that allowed for those enhancements. Ultimately, all employee classifications should have their total compensation looked at aand adjusted as needed but as you say, Prop B is not a good policy decision. The police and municipal reps negotiated underfunding for raises. Shame on them and the city for doing that. The fire pension did not. That is why they are the best funded of the three funds. They were the only responsible party involved. 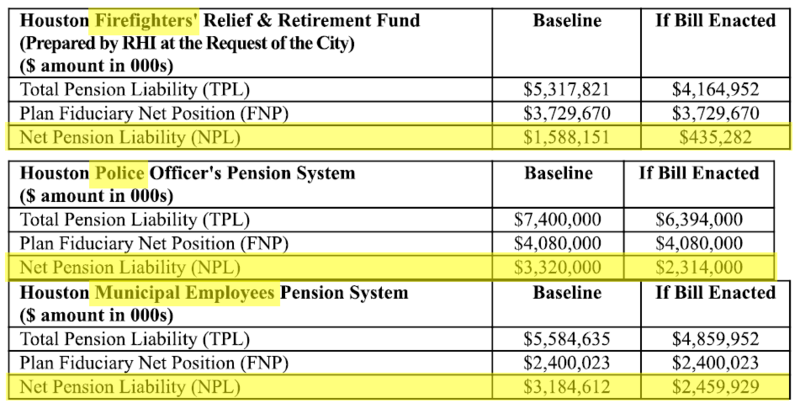 The pension problem would not be nearly as bad if the city had paid their annual required contributions. The pension, not the union, supplies the data annually to the pension review board. The city is not in the dark.